Yesterday was a day of surprise. For a while now, my Grandma Biggs has been wanting to get together with both my sister and I. She has been planning a day of whimsy and magic for us, and we had no idea what we were going to do. She gave us no clue other than that we should dress casual/nice and wear comfy walking shoes. I suspected that we were going to eat somewhere, but once we parked near the waterfront downtown, I figured we were going on a boat, or eating river front. 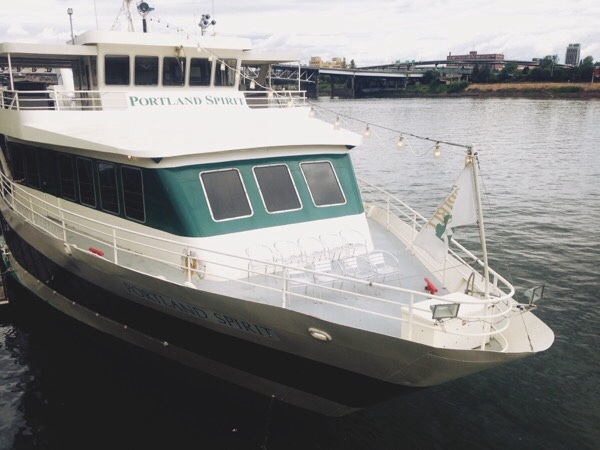 She lead us to the Portland Spirit, a restaurant cruise yacht for brunch and dinner. I was surprised, and super excited! 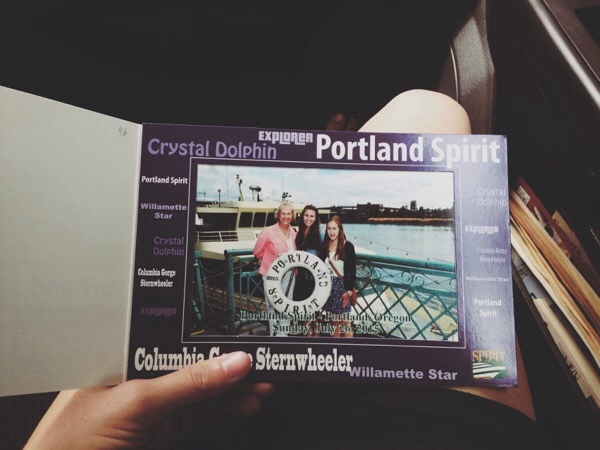 The Portland Spirit has a photographer who photographs every group who goes on the Portland Spirit. They develop them aboard ship, and you can buy your photo for $10. Grandma bought our photo, it is so cute. 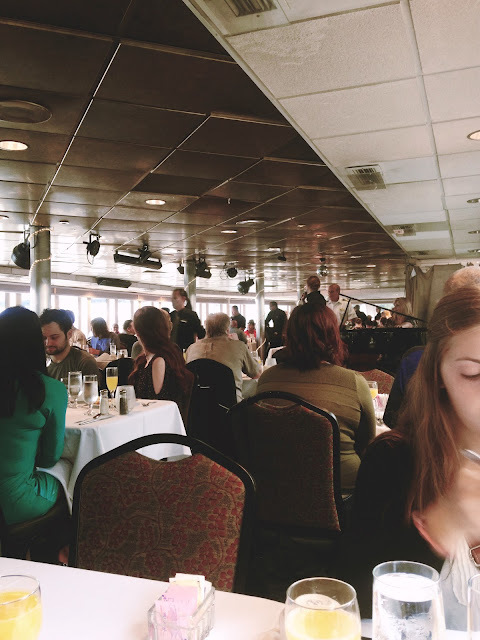 On the Portland Spirit, we were seated on the second floor, and we went through the buffet line. 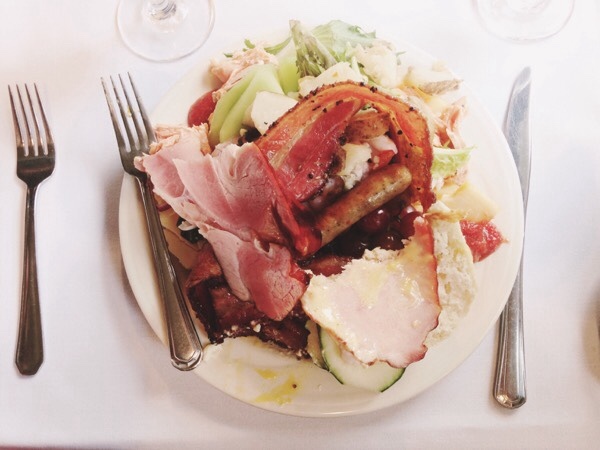 They had so much good food stocked in the buffet, I had to take a little bit of everything. What a mistake that was. While it was incredibly tasty, I ended up leaving some (quite a bit of) food on my plate, and I felt so bad. The food was fabulous, though, and id I were to do this again, I would grab just a few items, and go back up for seconds if I felt the need to. My favorite was the salmon, it was perfect, and tasted so good! It looked stormy all day, so the clouds looked incredible. 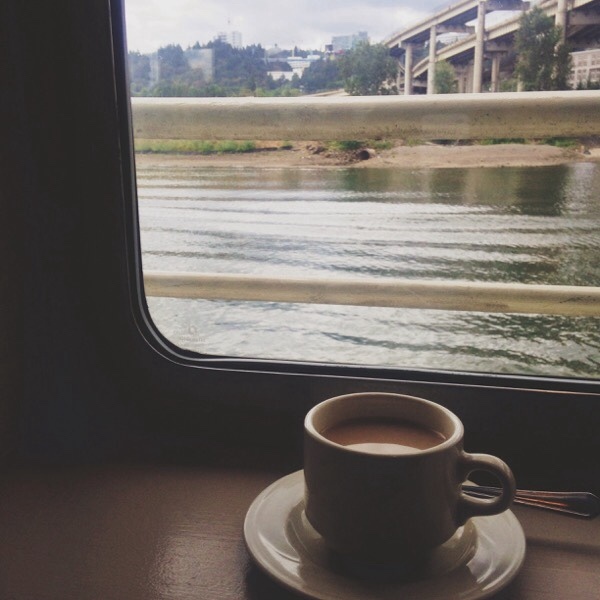 While we were on the two hour cruise, Grandma, Brittney, and I chatted, and caught up with each other's lives. There was a lovely pianist who could play any song, and the servers provided a bit of entertainment. 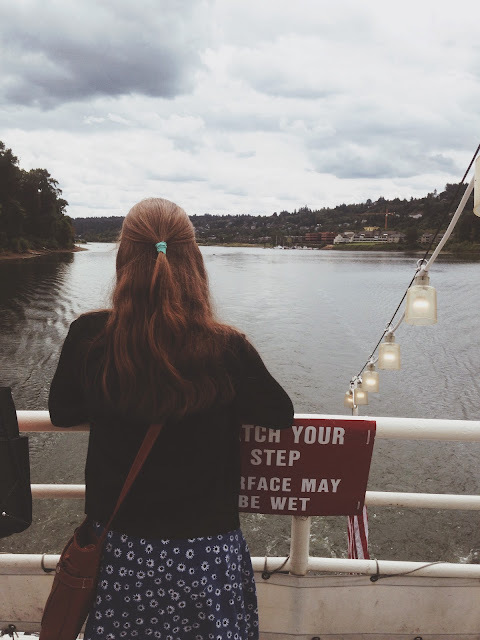 As we were cruising along, we passed OMSI, Oaks Park, a neighborhood of house boats, and huge, river front mansions that looked like palaces. 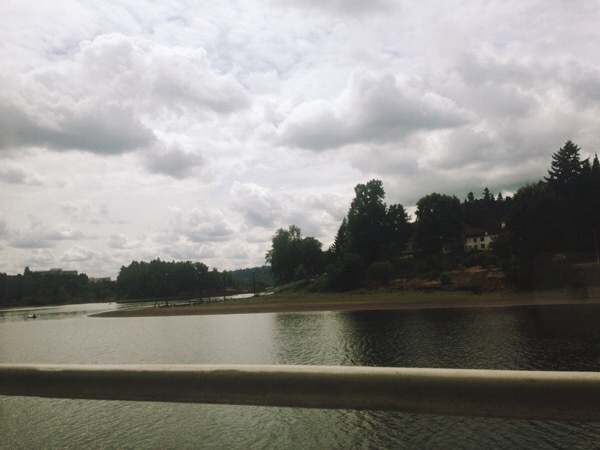 I never knew that thoses existed on the Willamette. It was amazing to see. On the way back, they set up the dessert buffet, and my Grandma picked up a plate for me. 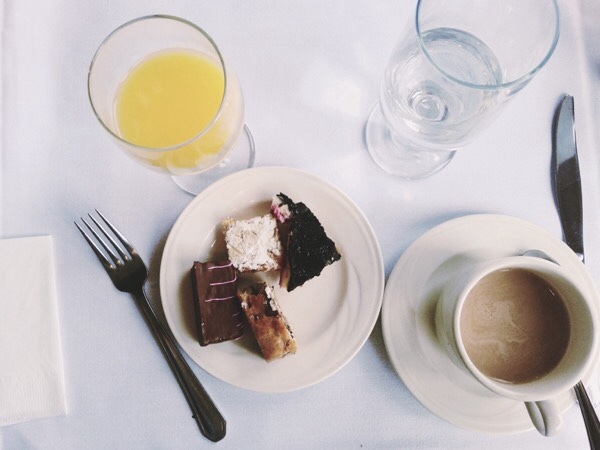 I only ate two of the desserts because the other two unfortunately didn't appeal to me. I had the chocolate chip cookie bar, and the raspberry cheesecake. They were delicious, and the perfect topper for that wonderful brunch. After we finished our brunch, we headed up to the top deck to look around. 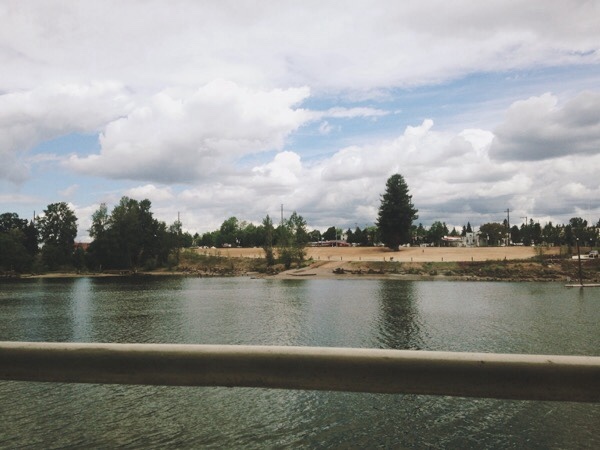 It was nice to get some fresh air, see the view, and chat with the other passengers aboard the Portland Spirit. 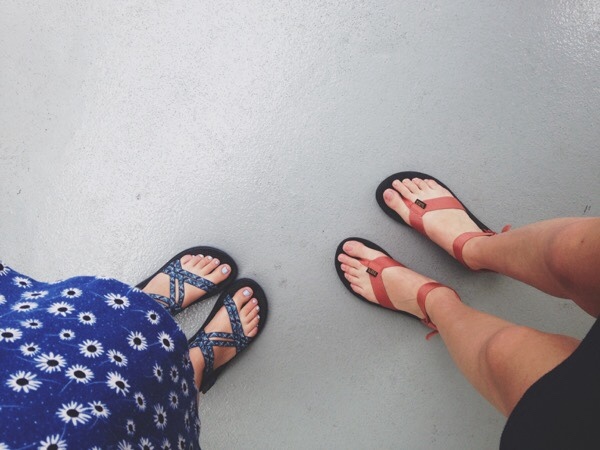 I noticed that Brittney and I were both coordinated with our footwear, in terms of having our toenails painted the same color as our outdoor adventurous sandals. As we were heading back, we cruised by The Big Float event. 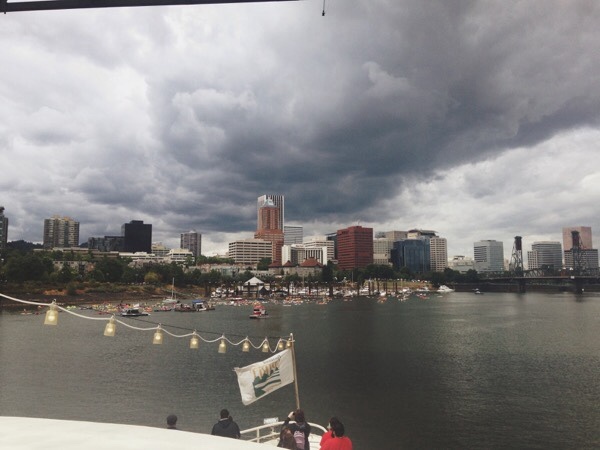 I guess in Portland, they have an even where everyone who wants to participate in this event brings their water flotation devices, whether it be an innertube, or a raft, or anything that floats. They bring their floaties, and just hang out in the Willamette for a couple of hours. They have a band that plays for them on the water, snack booths, a closed, private fenced off area where vendors set up tables for them. It is a big event, and it was fun to witness it. We cruised back to the dock, and thanked our captain. 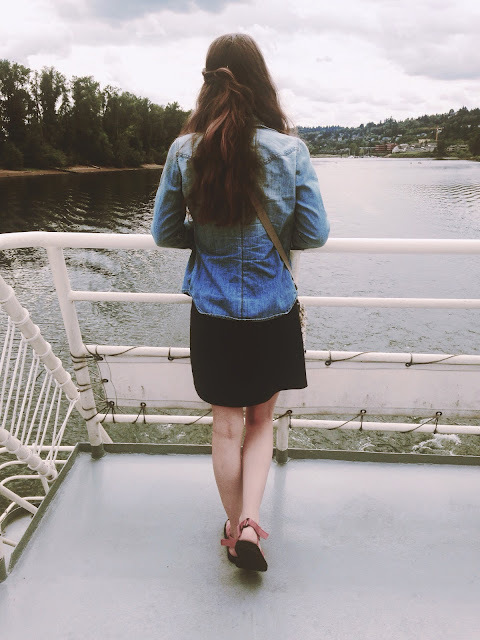 We got off the Portland Spirit, and took our time walking back to the car. There is so much to see in Downtown Portland, and especially since The Great Float event was going, there was plenty to see. 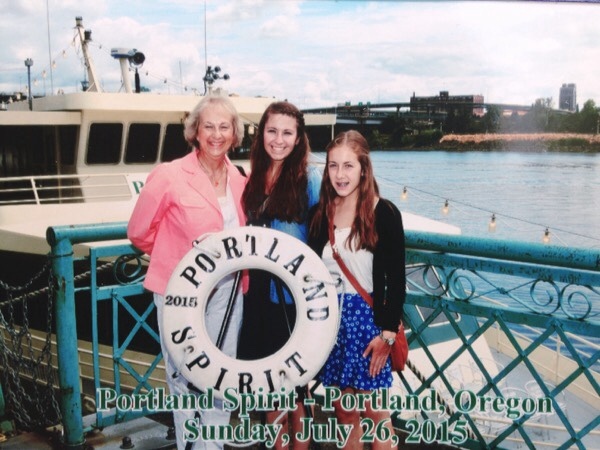 Our picture is perfect, and it captures the perfect time we had on the Portland Spirit. Thank you, Grandma! It was such fun day! You definitely surprised us.